In autumn 2016 one of the most prominent album of Hungarian music history, the ’Sheafs are dancing’ CD Deluxe re-release hit the shelves of local stores – the 2003 album was one of the best release of Djabe to date. The compositions were inspired by paintings of artist Imre Égerházi which gave the album unique importance. The editorial concept followed the ’one painting, one track’ policy and consists of compositions of bass guitarist Tamás Barabás and guitarist Attila Égerházi. The band succeeded in mirroring the visual thoughts of the painter, with sounds ’painted across’ the canvases, and carried the visual experience further. The tracks echo the spirit of the Great Hungarian Plain, the Transylvanian landscape, or the field trips to Italy, Bulgaria, Poland and France. Djabe received numerous foreign invitations with the album and this was the beginning of international career for the band. Replicas of the paintings made it to the high-quality handbook used by Djabe crew to pack the ‘Sheafs are dancing’ CD so tracks and paintings can easily be compared, looked in parallel granting a highly unorthodox music experience. Imre Égerházi, thought to be one of the most prominent artists of the Hungarian plain’s landscape well before his passing, created a unique visual world. Inspired by the slices of life and music from the Hungarian Plain, Hortobágy and Transylvania. The most value of his art is his unique style. In addition Imre Égerházi was Hungarian, but also a real cosmopolite – just like Djabe. The still-lifes of the artist mirrored his love for beauty and nature. 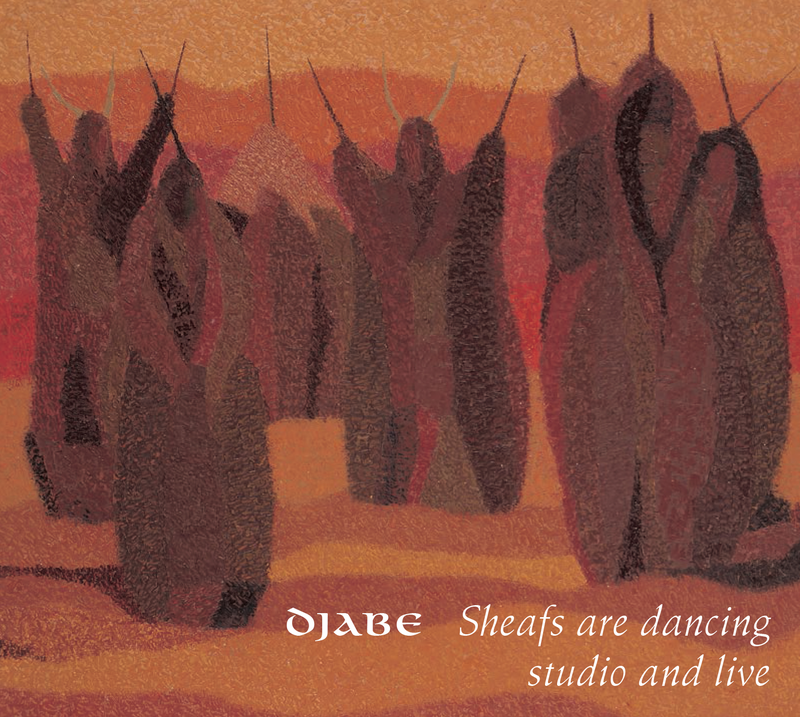 ‘Sheafs are dancing’ is one of the most important milestone in Djabe history for many reasons. For one, this album features more structured compositions. For more, after the different folk-like (African, Asian, Oceanic, Native American) elements Hungarian, Pannonian Basin folk tunes characteristics surface for the first time, mainly for bridging between the music and the style of the paintings. We must mention Ferenc Kovács’s powerful and ingenious violin play capable to embrace the whole Pannonian Basin with unparalleled musicality and spirituality, being “one of the most original sound in the whole of Europe”. His “uniquely Hungarian, rustic baroque play fundamentally defines” the CD. Being one of the most important milestone of Djabe, ‘Sheafs are dancing’ is an outstanding recording with professional mixing which results in a sounding of unparalleled quality, earning the praise of Hi-Fi enthusiasts and High End saloons. The epoch-making album’s DVD-Audio version had its authoring process made in London’s Abbey Road studio and received Prince Award in 2004 in “best multimedia creation” category. In the next year a nomination for “best extra content” was issued at Los Angeles Surround Music Award. Tamás Barabás made a triple effort for the album as composer, musician and sound engineer, all three with superb results earning professional recognition and praise for the artist. An outstanding performance the likes of which only few can achieve. The line-up of Szilárd Banai, Tamás Barabás, Attila Égerházi, Ferenc Kovács, Zoltán Kovács and András Sipos created a real wonder which became a profound element of today’s Hungarian cultural heritage. ‘Sheafs’ has some compelling guest musicians too: Judit Herczeg (vocal), Ben Castle (saxophone – known for Sting, Marillion, The Brand New Heavies, George Michael etc. ), Péter Szalai (tabla – known for Makám, Tin Tin Quartet, Mitsoura etc.) and Steve Hackett (guitar – known for Genesis). Latter artisian had his first appearance on a Djabe record with ‘Sheafs’, paving the way of years of cooperation with the band. The 2016 edition christined ‘Sheafs are dancing – studio and live’ and it’s first CD is essentially the same as the original release. The second, now-debuting extra CD entitled ‘Sheafs are dancing – live’ with recordings of four different locations but sounds as an integrated concert album, thanks to the quality editorial and engineering work. The concert CD’s main material, seven recordings from the ‘Sheafs are dancing’ album tour at Pesti Vigadó, Budapest in 2003. Further two compositions (Szemrehányás, Ház a dombtetőn) had its recordings done at the same tour but different location, at Petőfi Csarnok. In 2015 one of the band’s long-time dream came true, Repülés and Jégvilág compositions had their symphonic version was born. Tams Barabás recomposed the two compositions, arranged by pianist Zoltán Kovács with a 59 piece symphonic orchestra. The ‘Repülés’ and ‘Jégvilág’ recordings of ‘Sheafs’ concert disc was recorded at Művészetek Palotája, Budapest with the Hungarian Symphonic Orchestra Miskolc on November 10th, 2015. A further interesting fact about ‘Sheafs’ concert CD is aside from the 5 and 6 piece line-up of Djabe one track features a 7 piece line-up: recordings of ‘Fátyol mögött’ were made at a gig at New Orleans Club in 2004 with Viktor Tóth as a saxophonist; the artist was a full-time member of Djabe for a short time but no studio album was ever released under his membership. Memorable visual elements of these gigs were the background projections showing Imre Égerházi’s range of paintings and his own S8 film connecting to the painting’s theme along the concerts. The musical and audio visual sensations worked outstanding in tandem. The gigs were marvelous also because of the 5.1 live surround sounding praised by Djabe fans ever since. The two discs are packaged to a extended, 36-page hard cover handbook, on digipak trays. Form to content. Good to hold in your hands. This quality must only be presented this way. Five stars.